A periodontist is a dentist who focuses on diagnosing, treating, and preventing periodontal disease. These dental specialists also place dental implants and treat oral inflammation. As experts in periodontology, they receive extensive training beyond dental school. 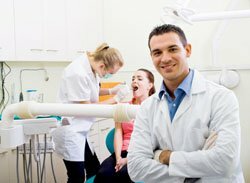 They are familiar with the latest techniques for diagnosing and treating periodontal diseases and are highly efficient in performing cosmetic periodontal procedures. Periodontists often treat complex periodontal cases in individuals with severe gum disease or those with complex medical histories. Depending on progression of periodontal disease in the patient, non-surgical and surgical treatments may be used. Dental implants, which can be used to restore missing teeth, are also one area of specialty for periodontists. During the initial visit, the periodontist closely reviews the patient’s medical and dental histories and evaluates their oral and overall health. It is essential for periodontists to be aware of any current medications that are being taken or systemic diseases that may affect the course of periodontal care. Next, a thorough examination of the gum tissue will be conducted. Any recession or deterioration of soft tissue will be notated. Assessment of patient’s overall bite including tooth mobility is also performed. After completing the patient’s perio chart, the periodontist will complete the assessment of a patient’s periodontal health with the help of radiographs to evaluate patient’s bone density. While some patients’ periodontal needs can be properly managed by their general dentist, patients with progressive periodontal disease are best treated by a periodontist. It is recommended that patients with moderate to severe periodontal disease, including patients with complex cases be managed by both their general dentists in addition to a periodontists. Our periodontist in Los Angeles offers comprehensive periodontal care as well as dental implants. Contact our office for more information.